My post on the Sicilian Dragon has been viewed more than any other at Jim West Talks Chess. In the following game from today's game/30 quad at the Polgar Chess Center, where I had a score of 1-0-2, my opponent misplayed the black side of a Ruy Lopez. Bobby Fischer places a ? after Black's last move in My 60 Memorable Games. Fischer gives 7...f6 8.Nbd2! Ne7 9.Nc4 as better for White. White has won a pawn, with another one soon to follow. Three pawns up, White has an easy win. 33...Bc2 34.h5 Bd1 35.h6 Rh7 36.Bg7 Ba4 37.Rxb7 Bb5 38.Rb6 Kd3 39.Rd6+ Kc4 40.g4 Kb3 41.g5 Bc4 42.g6 Rxg7 43.hxg7 Kxc3 44.Rc6, Black resigns. The Viking Last Saturday Quads were held today at a new venue, the Ramada Somerset. 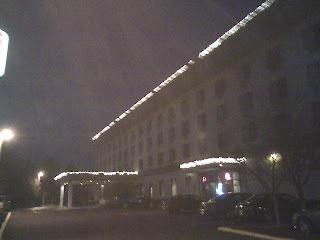 Below is a nighttime view of the hotel. 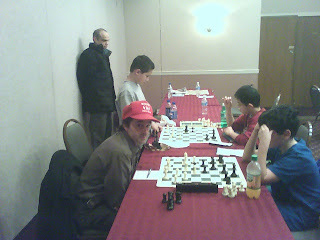 Next you can see the final round contests in quad two between Atlantic Chess News editor Steve Ferrero and Levy Rozman in the foreground, and between Alexander Katz and Arthur Shen in the background. Leaning against the wall is Boris Privman, against whom I drew my game in quad one. Fellow blogger Atomic Patzer, pictured below, also participated. I played in the top quad where I finished with a score of 1-1-1. In the third round, the Sokolsky Opening made a rare appearance. 25.Qe1 Bb2 26.Rd1 Rxa2 27.Kh1 Qf5 28.Qh4 h6 29.Rd7 Qb5 30.Rfd1?? Qxd7, White resigns. Tonight, and every Friday night, you can play USCF rated chess at the new Dean of Chess Academy in Branchburg. Here is editor Steve Ferrero's article on it from the latest issue of Atlantic Chess News. Chess Center Opens in Branchburg, NJ !! On November 10th, Dean Ippolito, LLC opened the doors to a new chess center located at 1161 US Highway 202 North, Branchburg, NJ 08876. The company headed by International Master and NJ Chess Teacher of the Year, Dean Ippolito, has taught in after-school programs throughout New Jersey and has decided to add a much needed central location. Dean of Chess Academy will offer many unique events along with traditional instruction and opportunities for the public to play. Classes are offered throughout the week at a variety of times to accommodate schedules. All ability levels are represented in scholastic classes but adults, seniors and parent/tot classes are also forming. In addition to classes, the center will host weekly league play. With a $25 annual membership, participants may play every Friday night in US Chess Federation rated games. The games are played at a time control of G/60 and begin at 7:30pm. Please arrive by 7pm to ensure that you will be paired to play. For those who are just looking for casual play, the center also offers open play which is free-of-charge. Dean of Chess Academy will host tournaments and opportunities to learn from some of the nation’s top players including Grandmaster Gregory Kaidanov. Chess-themed birthday parties can also be booked for those looking for a unique experience. Register for newsletter and e-mail update mailings by visiting www.deanofchess.com. We were thrilled to attend the opening of the Dean of Chess Academy in Branchburg, New Jersey. Dean and Dawn provide an exciting, fun-filled, challenging environment for chess players AND chess-playing families — a far cry from the smoke-filled, filthy places that I used to attend with my son (although they were wonderful as well). Dean’s quiet dignity and excellence with the game pervade the place and give it extraordinary karma. Charles had such a good time; I had to drag him out of there. Hopefully, this is just the beginning of many such oases in New Jersey. Here is an article, on children's chess in northern New Jersey, that appeared earlier this year in The Record of Bergen County. Today marks the first anniversary of my Jim West On Chess blog. In honor of the occasion, I have added some new features. These include photos and a link list. This year's Marshall Chess Club championship was won by grandmaster Jaan Ehlvest, the fourth time that he has won the event. Here is the final round draw from the ICA Early Winter 2007 tournament that enabled Ziping Liu to tie for first place in section 4. Both sides made mistakes in this game. A better move is 6...Nbd7. Black should wait for White to spend a tempo with 8.h3 before making this exchange. Now 10.Bxc6 is worth considering. Blocking in the bishop is a positional error. Black needed to played 14...c6. Now 15...Qe7 would allow 16.Nd5. The best that Black can do here is 15...Qc8. White can win a pawn by force after 17.h4 Qf6 18.Qxf6 Bxf6 19.Bxe5. No better is 21.Ne3 because, with White's queen on g3, 21...Qd4 snares a pawn. In the final position, Black still wins a pawn by 21...Qxc4. But he may have been worried about 22.Rd1. Usually I play the exchange variation against the Caro-Kann defense. But, in today's game/30 Swiss at the Marshall Chess Club, I tried a King's Indian Attack, barely managing to draw. 39.Bc4 hxg4 40.hxg4 Kxg4 41.Bxf7 Kxf5 42.Nd6+ Kf4 43.Bc4 g5 44.Nb5 Bb2 45.a4 Ke3 46.Kg3 Nd3 47.Bxd3 Kxd3 48.Kg4 Bc1 49.Na7 Bd2 50.Nc6 Kc4 51.Nxa5+ Bxa5, draw. At today's Hamilton quads, I finished with a score of 1-1-1. In the final round, my opponent allowed a standard exchange sacrifice against the Sicilian Dragon that ended the game quickly. 13.h4 Ne5 14.h5 b5 15.hxg6 hxg6 16.Bh6 Bh8 17.Bg5 Nc4?? 18.Rxh8+ Kg7 19.Bxf6+ Kxf6 20.Qf4+ Kg7 21.Rh7+, Black resigns. For those of us who were unable to attend Garry Kasparov's book signing on Tuesday, here is what we missed. This past Sunday, at the ICA Early Winter 2007 tournament in Hackensack NJ, my student Ziping Liu had a performance rating of 1572. His score of 3-0-1 was good enough for a first place tie in section 4. On Monday, I received this e-mail. Just a quick queston about the Amateur Team East held each February in New Jersey. Can any group of chessplayers make up a chess team name with four members and an alternate, or does the chess team have to be made up of local chess club members, and what is the breakdown on the chess ratings of the chess team members, and finally how does each chess team advance in the Amateur Team East chess event? The short answers to your multi-leveled question are: yes, no, average of 2199 or below, and winning each match by at least 2.5-1.5. Any group of four USCF rated players (plus one alternate, if you choose) whose combined ratings average out at less than 2200 can form a team. They do not have to be local chess club members, although quite often that is the case. Your team advances by winning its matches. The margin of victory in each match determines tie-breaks at the end of the tournament. Naturally, sweeping a match 4-0 provides the best tie-break points; a narrow victory, the least. When my team won the USATE 1999, it happened on tie-breaks. My advice to you when forming a team is to avoid the top-heavy approach of very highly rated players on the top boards and extremely weak players on the lower boards. Try for a more balanced mix. The most important player on your team could be your lowest rated one! In 1999, my board four scored 4-0-2. Basically, we started every match feeling that we were already ahead of our opponents! This morning, Garry Kasparov will be signing copies of his book How Life Imitates Chess at Borders Bookstore in New York City. Supposedly Bobby Fischer has written an improved book My 61 Memorable Games. Or is it just a hoax? In the following game from today's International Chess Academy tournament in Hackensack NJ, my opponent found an ingenious way to draw what looked like a lost position. The time control was game/90. I could have won easily with 40...Qc2!. 45.Qxa6 Qh7+ 46.Kg1 Rb1+ 47.Rxb1 Qxb1+ 48.Kh2 g3+ 49.Kh3 Qf5+ 50.Kh4 e2 51.Qa8+ Kg7 52.Qg8+! Kxg8, stalemate. FIDE master Jairo Moreira works in a couple of schools in the Princeton NJ area, including Princeton Day School. He is looking for a chess instructor to work for him, two days a week, in after-school programs near Princeton. You can phone him at (718) 710-2717, or e-mail him at imjairo@gmail.com. In America, we have a saying: "You can't fight city hall!" On Wednesday, Garry Kasparov found out that it is even more difficult to fight the Kremlin when he was forced to give up his quest for the Russian presidency. In his Blog Trekking, November 2007 post, Mark Weeks includes my review of King's Gambit in the books section. Everyone is a winner at this month's chess carnival! Paul Hoffman, author of King's Gambit, sent me an e-mail yesterday in response to my review of his book. Here, in part, is what Hoffman wrote regarding my criticism that some of his anecdotes were inaccurate. Before I wrote the footnote on Rossolimo's death, I researched it. I had remembered two conflicting stories from 1975. The one I ultimately reported, and the one that he was pushed. I tracked down people who knew him very well then, and they said there were no muggers or other people involved, so I went with that. I am of course quite embarrassed by the Caro-Kann mistake, I've played the exchange Caro-Kann my entire chess life, so I have no idea why my neurons misfired and I wrote French Defense. Nor, obviously, did I catch it on subsequent readings. I'm not sure of the psychological phenomenon here, but I've noticed that sometimes when I make an obvious mistake, I keep on making it until someone else points it out. Which is why everyone needs a good editor. Some very strong chess players read the whole manuscript and caught much subtler stuff, but this too went by them. The good thing, though, is that when my book goes to paperback, I can fix errors like this. I've put a page on my Web site where I report corrections: http://paulhoffman.wordpress.com/kings-gambit-corrigenda. I think that you might find, if you wrote a book of 150,000 words, that some obvious-in-hindsight errors would slip in. I'm not proud of this, but it happens. Hey, I know very well what opening Noah played! I can agree with Hoffman's statement about "obvious-in-hindsight errors" from my own experience with both books on the Philidor Counter Gambit. No matter how meticulously you proofread, you always miss something! Yesterday at the Polgar Chess Center, I played the following game in a game/30 quad, finishing with a score of 2-1-0. 34.Re3 Kf8 35.Re4 Rc5 36.Nxa4 Nxa4 37.Rxa4 Rxd5 38.Rb4 b5 39.Kg3 Rd3+ 40.Kf4 Rxa3 41.Rxb5 Kg7 42.f3 Ra4+ 43.Ke3 Rxh4, White resigns. Kasparov on "The Journal Editorial Report"
Last night at 11 o'clock, the Fox News Channel aired an interview of Garry Kasparov on The Journal Editorial Report. You can view Kasparov's Next Move here, in the Past Shows area. Of the ten players who participated in today's game/30 Swiss at Cherry Hill, seven including myself were masters. Here are my best games. 27.h6 Rg6 28.Rxg6 hxg6 29.Qg5 Kh7 30.hxg7 Kxg7 31.Re3 Qe7 32.Qf4 Qd6 33.Qg5 Qe7 34.Qf4, draw. 19.g4 Qf4+ 20.Kb1 Bxg4 21.Qd5 Rd8 22.Qb5 Bxd1 23.Rxd1 Rxd4 24.Rg1 Qxf2 25.Rf1 Qxf1+, White resigns. Tonight at 7:30, the 91st annual Marshall Chess Club championship begins. It is a nine-round Swiss that will take two weekends to complete. Steve Ferrero is my team captain at the U.S. Amateur Team East, as well as editor of Atlantic Chess News. His favorite opening move as White is 1.b3, which I have tried occasionally myself. Here Ferrero draws against a stronger player at the Viking Last Saturday Quads in Mount Arlington. Bobby Fischer preferred to play 3.c4. Instead 7.cxd5 Nxd5 8.Nc3 Nxc3 9.Bxc3 Bd7 leads to an equal position. White has a clear advantage. A more ambitious player as White might have kept queens on the board, but Ferrero is happy to draw against his higher rated opponent. Probably Black's reluctance to allow a draw explains why he did not exchange with 20...Bxc5 21.Rxc5. 21.Kf1 Kd6 22.Rc2 Rhe8 23.Rd1 Re7 24.b4 e5 25.dxe5+ fxe5 26.Ne4+ Ke6 27.Nc5+, draw. At Jim West Talks Chess, my post on 1.e4 e5 2.Nf3 d6 3.Bc4 f5 4.d3 c6 5.O-O f4 (dubbed "the Philidor clamp" by Michael Goeller of The Kenilworthian) has been viewed frequently. 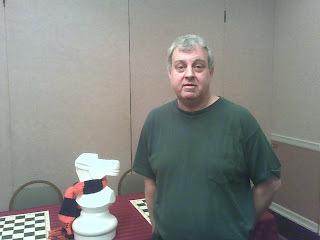 On Friday, I received an e-mail from Steve Owens who is hosting a chess carnival, scheduled for December 10th, at website http://blogcarnival.com/bc. As a blogger, I was invited to submit articles for inclusion in this blog carnival. These are the posts that I submitted, arranged by categories: book reviews, opening theory, chess culture and politics, annotated games, humor, and chess events. In the United States Chess League, the Dallas Destiny edged out the Boston Blitz to win the finals. In a Wall Street Journal article, Garry Kasparov describes his five-day ordeal in a Moscow jail. In the following game, Atlantic Chess News editor Steve Ferrero upsets a higher rated opponent at the Ernesto Labate Grand Prix in Westfield. For 3...gxf6, see my game as Black against Asa Hoffmann. 4.d5 Qb6 5.Qc1 Be7 6.e3 O-O 7.Nd2 Qa5 8.c3 b5 9.a4 bxa4?! Black should have played 9...b4. Now White has a slight advantage. White could have forced a draw by 25.Qh1+ Kg8 26.Nxg6 Rxf2+ 27.Ke1 Bf6 28.Ne7+ Kf8 29.Ng6+ Kg8 30.Ne7+, etc. Perhaps White continues playing this hopeless position because, with a time control of game/40, Black may be behind on the clock. 33.b3 Qe5+ 34.Kd2 Bg5+ 35.Kd3 Qd5+ 36.Ke2 Qxb3 37.Qa1 Nd5 38.c4+ Nf6 39.Qe5 Qxc4+, White resigns.